A sales meeting is a necessity for any business, as it helps in creating motivation and communication between the members of your sales team. A wide range of topics are commonly covered in sales meetings, including employee issues, project updates, new businesses and deals, and administrative announcements. You can also see Meeting Agenda Templates. Like any other agenda, it is required to confirm the meeting’s purpose first, so that you can create an agenda and concentrate on the most relevant topics related the company’s sales. 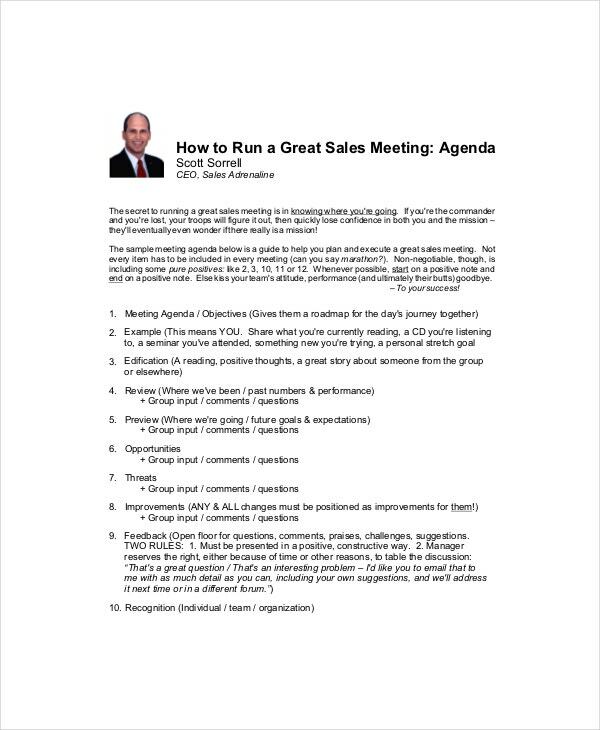 Although you can always follow a general rule of thumb, developing a specific sales meeting agenda definitely helps. 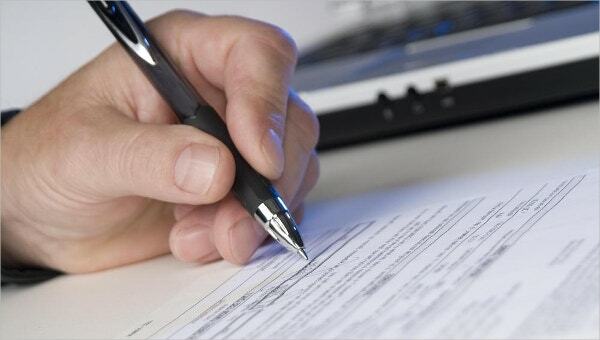 This helps in streamlining the process of the sales meeting through the organization. If you are a business owner, your entire revenue depends on how much sale you make. You can call a sales meeting to discuss the sales figures and know your progress. 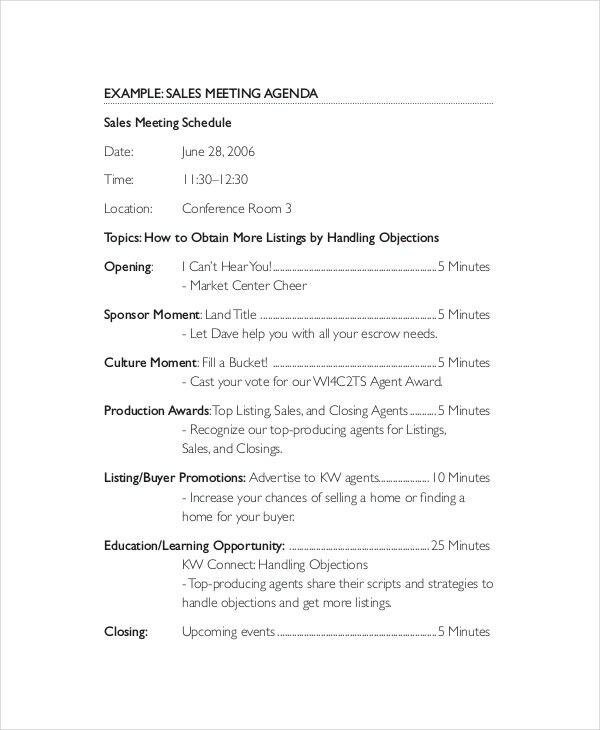 A sales meeting agenda template for businesses helps in creating an agenda for such meeting. If your business is not receiving the expected amount of sales, you may call a sales meeting to identify what’s wrong and what can be done to improve the sales. This is more future-oriented sales meeting, and focuses on what needs to be done in future to improve business. 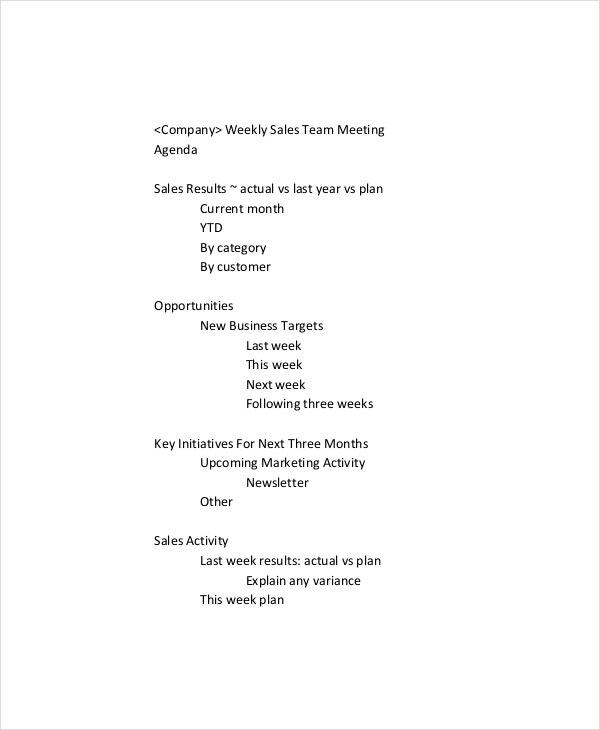 Use a sales meeting agenda template to create such agenda. Some employees may be more active in maximizing your sales than others. It is important to identify the weak and strong links of your sales team, and work accordingly. So, some sales meetings may be called to focus on your sales employees specifically, and agenda for such meeting will be somewhat different than others. 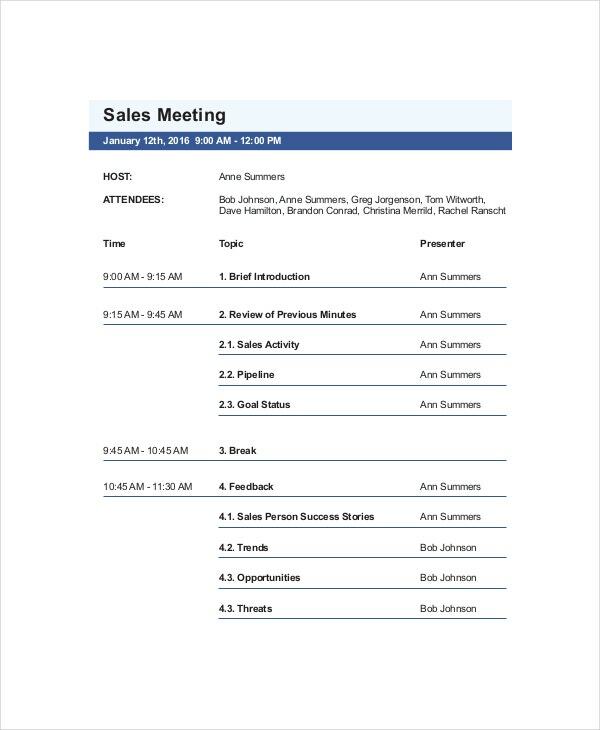 A sales meeting agenda template gives a background to create this agenda. Leaders of the sales team may call a meeting to discuss the sales performances, and plans to improve sales. Such meetings do not usually include the higher authorities of the company, and are taken care of by the leaders of the sales teams only. So, they are somewhat different from other meeting agendas. 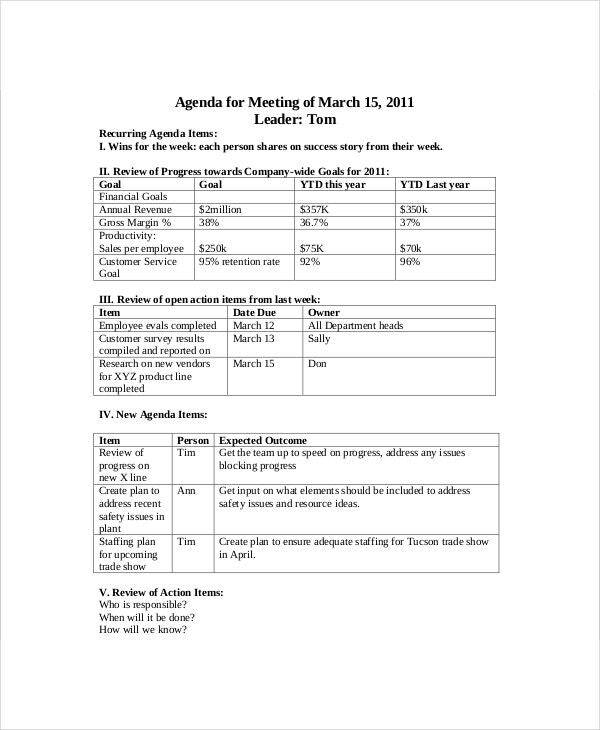 Use a sales meeting agenda template to create a perfect agenda. You can also see Agenda Templates. Calling sales meetings to celebrate success stories creates massive motivation among the sales team members. Such meetings often include reading out stories of successful sales people and honoring them. 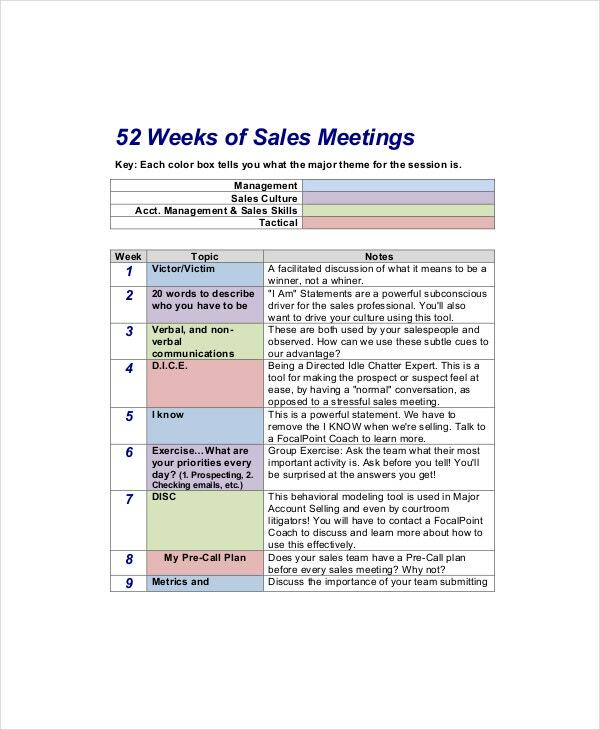 A sales meeting agenda template helps in creating agenda for such meetings. 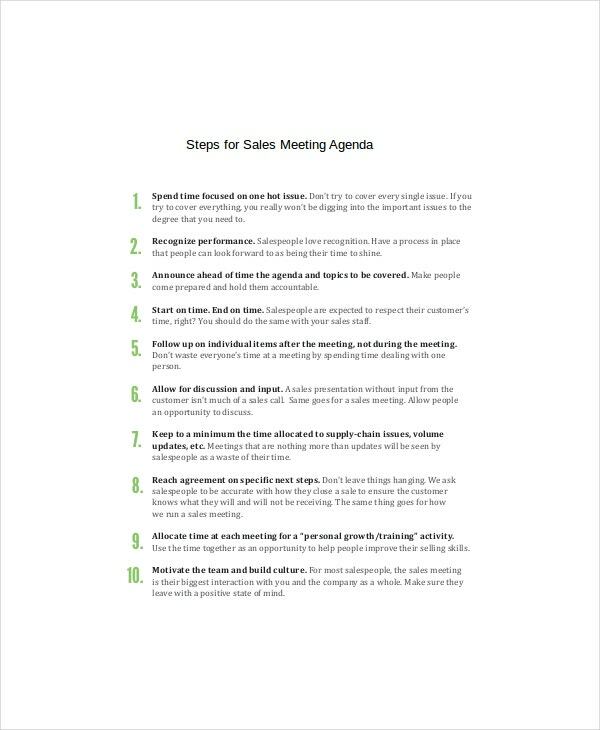 A sales meeting agenda template often includes the purpose of the meeting, focused topics that need to be brought out in the meeting, the reviews of previous agendas and the preparation task. 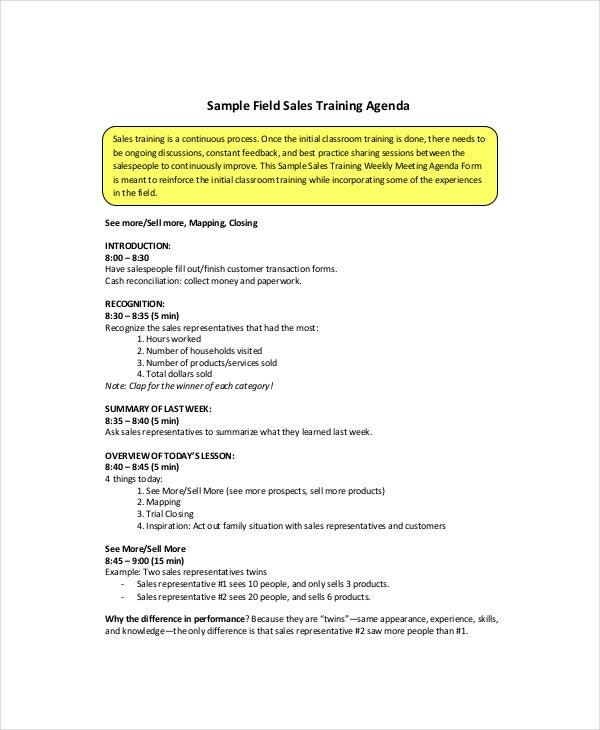 Once you have created a sales meeting agenda with a template, you need to distribute it among your team members so that they come prepared with the needed information. 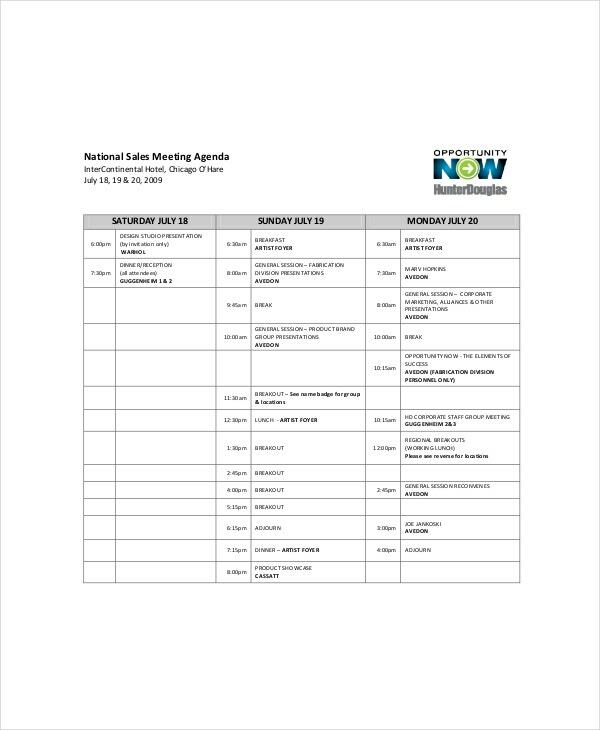 A sales meeting agenda template can help in creating the perfect agenda as per the requirements and preferences of the business. 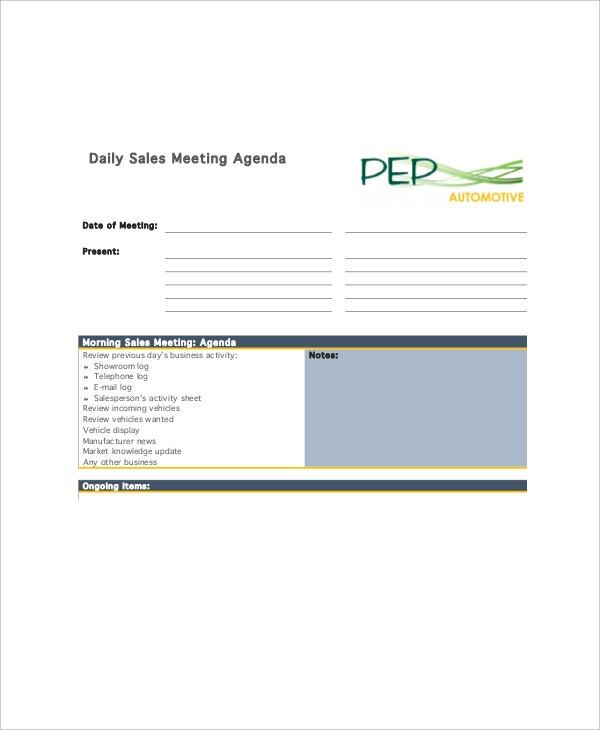 Download an appropriate sales meeting agenda template from here, and save time and energy by creating a perfect agenda within minutes. 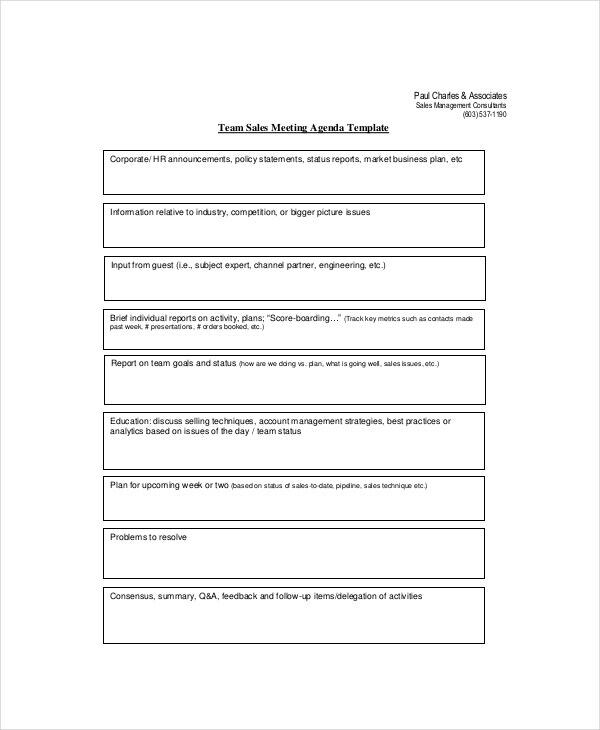 These templates can be easily used to create an agenda even by a novice in your sales team. You can also see Agenda Planner Templates.